Here’s the thing. I seem to be missing the knack for realizing when a fabric is going to end up looking like pajamas. This is not the first time it has happened to me… in fact, I can immediately think of two others. We all know that I like prints, and there seems to be a combination of print/color/someothercharacteristic which = PJs. And it’s only happened to me with knit fabrics so far. I know, most knit garments are a skosh away from sleepwear anyway, blah blah blah. Most of mine don’t look this much like it. Anyway, although I’ve seen animal print trends come and go several times in my life, they’ve never appealed to me. But in the last year or so, I’ve collected several in my stash. I’ve realized that I like loosely interpreted animal prints. I can handle the design itself, but I need some color. The fact that these colors haven’t appeared on any zebra at any time in history is immaterial (har-har). But enough about me and my misguided fabric selections. 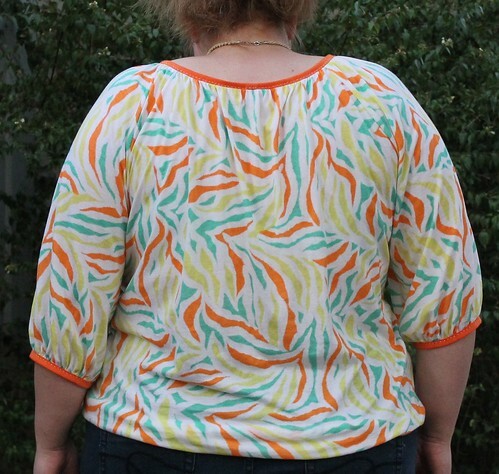 Let’s talk about Simplicity 1805. This pattern was part of their summer collection this year, and I rarely see a 99¢ knit top pattern that I don’t add to my collection. This one has two main designs in the envelope — the one I made here, with several raglan sleeve options including a cold shoulder, plus another with cut-on sleeves and options for side ruching or a hem band. I opted to try view E with the drawstring. When I first started this project, I thought I might like to add the sleeve bands from view D, but figured that I would decide at the end. My husband and I both thought the pajama factor was even worse without those bands, so I added them even though it meant more gathering. I cut an XL with no modifications. 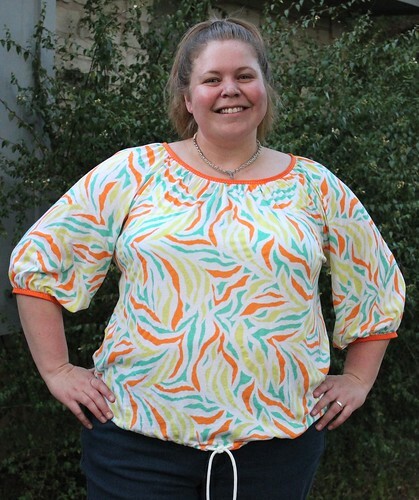 There is a ton of ease in this top (8-10″ at the bust for this view) so it was plenty to accommodate my several-sizes-larger hips. I usually pay no attention whatsoever to knit binding pattern pieces, opting instead to measure what I need based on the amount of stretch in my fabric. This time I did use them, as they determined the finished size of the neckline and sleeve bottom post-gathering. Speaking of gathering, there is lots, which I know turns some people off. It’s not lightning quick, but here’s the method I like the best. Sew two rows of long gathering stitches, each one 1/8″ to either side of the seamline. Pull threads to fit desired length, baste with pins, stitch. Using this technique, I don’t sew over the gathering stitches during the final stitching, so I find they are much easier to remove. 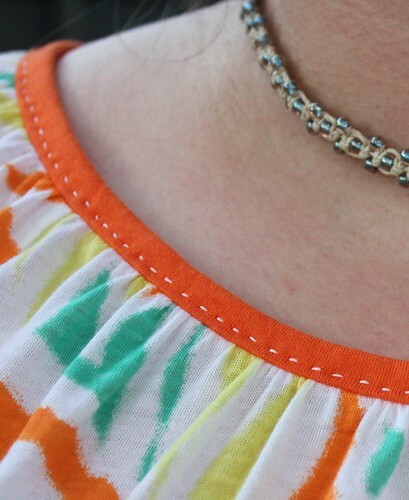 When I used to sew a row of gathering stitches on the seamline, I never did the final stitching in exactly the same place, which meant that removing the gathering stitches afterward took much longer. Does that make sense? If not, I’m happy to do a tutorial. I’m almost sure that I don’t think I’ve completely forgotten how to sew with woven fabrics. I’ll have to give it a shot again one of these days. Hmmm . . . not sure I agree with you. I think the PJ Factor is pretty low! 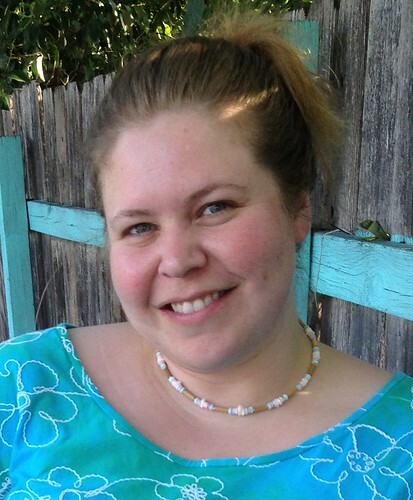 To me it looks like a top you’d get at Anthropologie, especially because of your hand stitching around the neckline. I really like it! Don’t think I would have ever looked at this top and thought pajamas…but hey, if they feel like pajamas, they’re my kind of clothes! I don”t think PJ’s when I look at it… I think fun… Enjoy wearing it! Love your top, I am going to check out that pattern. Enjoy wearing it, it looks great on you. Susan, it doesn’t scream ‘jammies’ to me either. Now if you made pants to match that might be a different story ;0. Love the handstitching too, really a nice finish! I don’t think it looks like pajamas, either! It’s super flattering, and you did a great job on it. Thank you, Erin! I’ve been thinking lately that I need to whip out a couple more from this pattern. I wear this one all the time!! For me it doesn’t look like a pyjama at all. It is lovely. The hand-stitch a contrasting running stitch was a great idea. Your top is unique that way with a personnal touch. Love the top! Of course, it’s now 2018 and everything is in! My first thought was, I’d love to have that pattern!